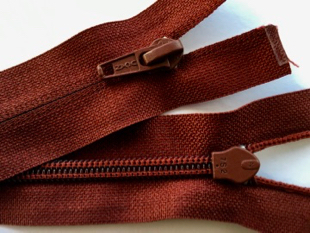 These LOOK like an invisible zipper, but they are really just a coil zipper that has been turned around so that the coil doesn't show. You might have this zipper in a Columbia jacket. This would be a good replacement zipper for a pocket or maybe a vest? #7 Coil is tricky.... YKK calls it a #5 or 5mm. My favorite zipper vendor in Europe calls this a #7 or a Euro 5. It's a bit bigger than a 5 but the nylon filament is a larger diameter making this stronger. I have some really fun pulls & a bit of yardage for use in cushions or backpacks. Look under #7 under Categories on the left.